The main reason a rattlesnake has a rattle at the end of its tail is to scare off predators. The rattle is composed of a series of hollow, interlocked segments made of keratin, which is the same substance that human nails and hair are mainly composed of. Snakes contract their tail muscles when startled or when they want to warn another creature to stay away, and that causes the segments to vibrate against each other and create a rattling sound. The muscles that cause the rattle to shake are strong and tireless, so snakes can keep up that sound for a very long time if needed. Different species of rattlesnakes have different size rattles and produce different sounds, but anyone who has heard an aggravated rattlesnake will agree that the sound closely resembles that of a baby's rattle, hence the name. A new rattle segment is added each time the snake sheds its skin. They may shed their skins several times a year depending on food supply and growth rates. Rattlesnakes travel with their rattles held up to protect them from damage, but in spite of this precaution, their day-to-day activities in the wild still cause them to regularly break off end segments. Because of this, there is no way to accurately determine the age of a rattlesnake based on the number of rattles on its tail. Since they haven’t yet shed, newborn rattlesnakes will have no segments to vibrate against each other and can’t rattle. 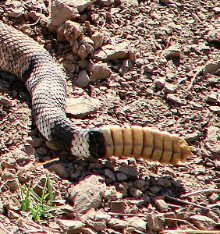 In the first week or two of its life, the young rattlesnake will shed its skin for the first time and add the very first segment of the rattle, but until then it can become easy prey for hawks, weasels, and even other much larger snakes. Not that you want to get too close to this pit viper, but one way to tell the difference between male and female snakes is that males have thicker and longer tails. 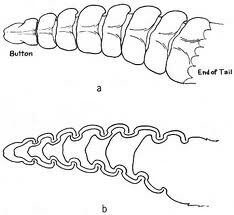 In addition, tails of males taper gradually from the body, whereas the tails of females narrow abruptly. When you think about it, a rattle warning is beneficial to all who hear it. The rattlesnake doesn’t have to waste its venom or risk injuring its teeth biting an animal (or you) that it can’t eat, and the animal (or you) that crossed the path of the rattlesnake may go by unharmed.